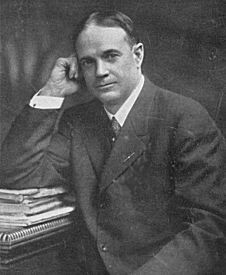 Billy Sunday was born on November 19, 1862. His father died soon after he was born, which left his mother with 3 children. His mother later remarried and had 2 more children. When Billy was 13 unfortunate circumstances made his mother send him and his older brother to an orphanage. After being in the orphanage for two years, Billy ran away and found a job as a stable worker in Nevada, Iowa. He worked for Colonel John Scott, who also provided Billy with a place to live and sent him to school. Billy did not finish high school, instead he moved back to his hometown Ames, Iowa where his baseball career began. Soon after he moved to Mashaltown, Iowa to play for a local baseball team. 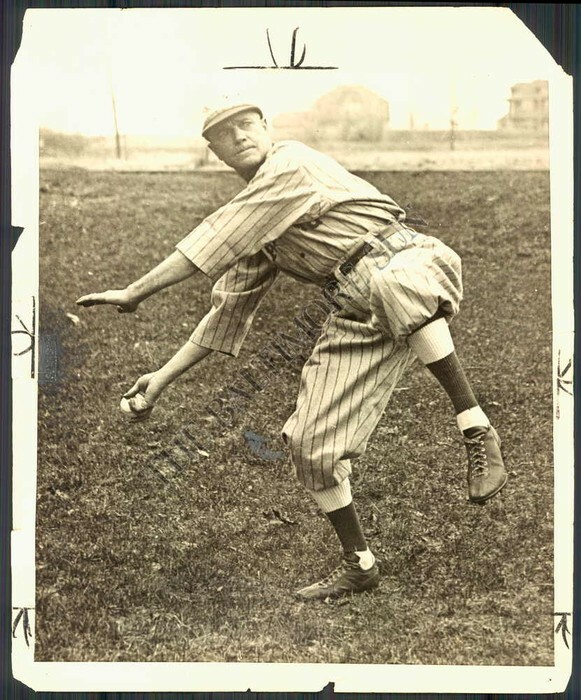 A scout was sent to watch him play and he was recruited to the Chicago White Stockings. Billy struggled with batting at first, but excelled in stealing bases. His professional baseball career lasted 8 years, which was when he "accepted Christ" for the first time. 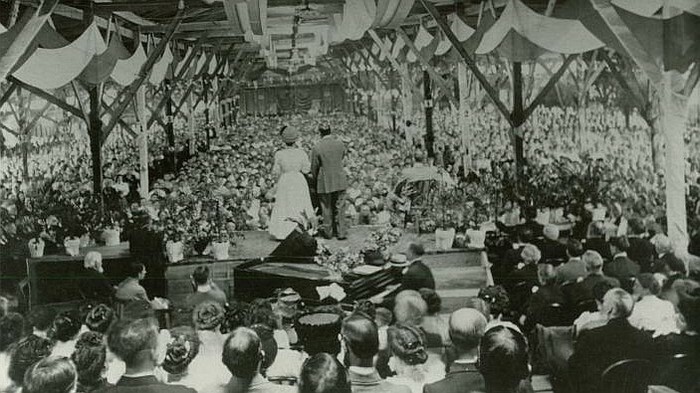 In 1891 Billy devoted his life to the YMCA (Young Men's Christian Association). He started out as the assistant of evangelist, J. Wilbur Chapman. By 1896 he went was a solo evangelist, he was ordained in 1903 Preacher in the Presbyterian Church. He became well known for his sermon "Booze, or Get on the Water Wagon" and was a monumental influence on Prohibition in 1919. He continued to preach against alcohol even after Prohibition was repealed. He turned millions away from drinking and pointed them towards the words of Christ. 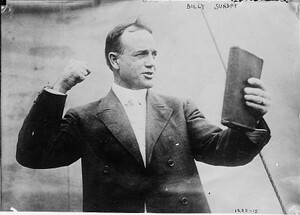 Billy Sunday doing what he loved most. Billy "Throwing a speed ball for God!" 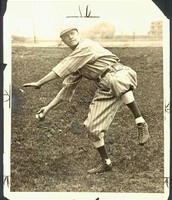 Billy when he played in the outfield for the Phillies. 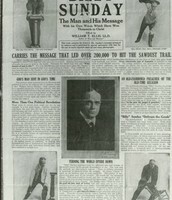 "The Man and His Message"
An advertisement in a newspaper about Billy Sunday. Where was Billy when he realized he no longer wanted to play baseball? 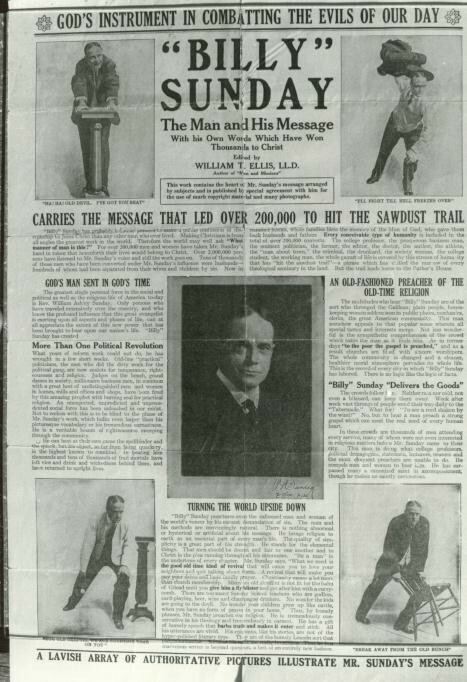 What made Billy Sunday an outstanding preacher? Did Billy support or reject Prohibition in 1919?